The Bernadette Foundation is a non-profit, interfaith, educational organization founded in 1982 by Rev. Josiane Antonette. The purpose of the Foundation is to enhance balanced, conscious living and dying by assisting individuals to understand their spiritual nature and their common connection with all lives. Through lectures, services, classes, and retreats, the Foundation provides a supportive environment for self healing and expanded awareness. It was in the late seventies that I had my first contact with Bernadette Soubirous, the seer of Lourdes. Shortly after meeting her, my awareness about the world of Spirit began to change dramatically. Within a year of meeting Bernadette and through her guidance I created the Bernadette Foundation, a nonprofit interfaith organization, with the dream of inspiring a gentle change in the way we look at death and care for the dying, as well as the way we look at life and care for the living. Later it was also Bernadette who helped me to understand the need to take care of our beautiful planet and who brought me closer to the earth she loved so much, and to a more earth based spirituality. For more than thirty years and throughout the many personal changes I have experienced as I responded to the call of my Soul, the gentle guidance and support of Bernadette has never ceased to reassure me that I am on the right path. 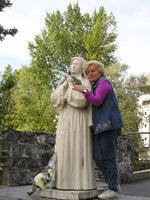 Famed visionary of Lourdes, Bernadette was baptized Mary Bernard. 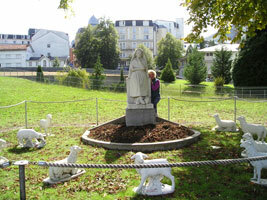 She was born in Lourdes, France, on January 7th, 1844, the daughter of Francis and Louise Soubirous. Bernadette, a severe asthma sufferer, lived in abject poverty. On February 11th, 1858, she was granted a vision of the Blessed Virgin Mary in a cave on the banks of the Gave River near Lourdes. 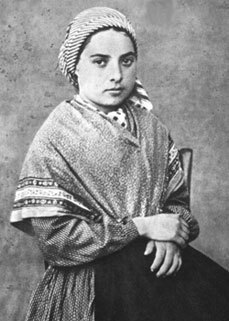 She was placed in considerable jeopardy when she reported the vision, and crowds gathered when she had further visits from the Virgin, from February 18th of that year through March 4th.The civil authorities tried to frighten Bernadette into recanting her accounts, but she remained faithful to her vision. On February 25th, a spring emerged from the cave and the waters were discovered to be of a miraculous nature, capable of healing the sick and lame. She died in Nevers on April 16th,1879, still giving the same account of her visions. 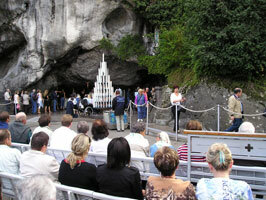 Lourdes became one of the major pilgrimage destinations in the world, and the spring has produced 27,000 gallons of water each week since emerging during Bernadette's visions. She was not involved in the building of the shrine, as she remained hidden at Nevers until her death at the age of 35. Bernadette was beatified in 1925 and canonized in 1933 by Pope Pius XI.